Congratulations! And thank you everyone for participating, we’ll check out your favourites! October 14th celebrates the birth of the photobook, way back in 1843, with the creation of the first known photobook Photographs of British Algae by Anna Atkins. We at ceiba love photobooks, 3 years and 7 1/2 books later, we are happy to continue creating and sharing them. We’re celebrating World Photobook Day with a giveaway, again, it’s becoming a tradition! 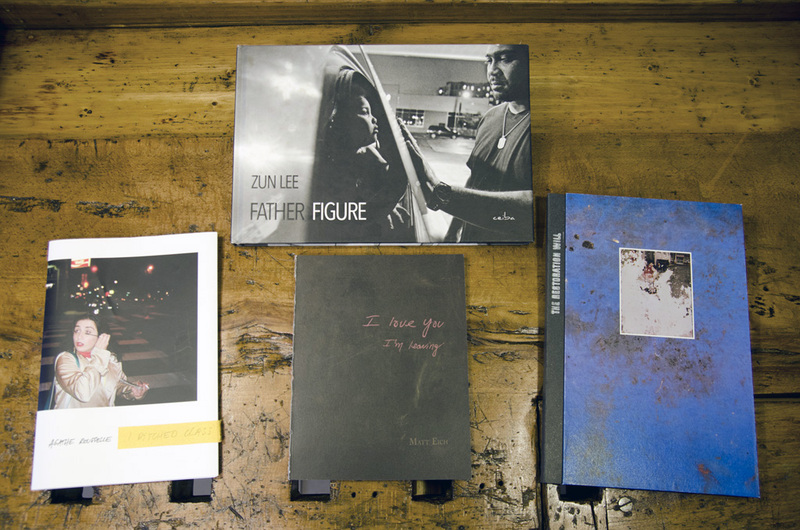 Tell us about your favorite photobook in a comment below (any photobook!). One lucky person will be chosen at random to receive a free copy of one of our available titles: Father Figure, I Ditched Class and I Took a Bath, I Love You, I’m Leaving or the upcoming The Restoration Will, your choice! Entries are accepted from NOW until Sunday, Oct 15 at 11:59pm EST. Have fun, we certainly do! Matt Eich’s newest book, I love you I’m leaving is an honest and at times a painful look at how fatherhood and domesticated life can be. It is important document of a side of family life that tends to get overlooked in a society of carefully curated social media feeds. R. Avedon, “In the American West”: sumptuous portraiture. Would have liked to see the original big prints exhibition, tough. Keep up the good work, Ceiba! Klavdij Sluban ‘East to East’ is one great atmospheric journey. Published by Dewi Lewis. I love Sam Harris’s photobook Middle of Somewhere. I took a class with him, which put me on the path of becoming a photographer myself. It’s always difficult to pick just one favourite but I’ll go for ” Self and Others ” by Shigeo Gocho , at first it seems mostly a simple set of portraits but there is something unique and atmospheric about the images. Maybe enhanced by knowing the photographers life story and health condition plus if read in conjunction with watching the film of the same title by Sato Makoto it’s a very emotional experience. I always come back to Olivia Arthur’s ‘Jeddah Diary’ for its simplicity, significant narrative, and Arthur’s clever use of reflected light to obscure the faces of people who wished to remain anonymous. Daido Moriyama, “Farewell photography”. I wish it would be still possible to find it somewhere! I’m very into a compilation of Italian black&white street photography called “La Strada”, published by Damiani. A good match for fans of the genre with a few famous legendary pictures but also true rare Pearls to discover. Very classic. Wow!!! What a great idea for such greats books ! You ROCK, Ceiba ! Amongst my favorites, my most favorite would be “At home” by Bruce Wrighton ! A fantastic discovery due to Roland Angst. Andrea Alessio’s Before You Santa Claus Life Was Like A Moonless Night. The title may sound a bit tongue-in-cheek, but the photographs are decidedly earnest. Alessio drove around Treviso, Venice and Pordenone, making images of pitch-dark landscapes illuminated by Christmas lights. With atmosphere so dense, you can almost feel the chill of the night air. Not a popular choice, but I love this book very much. 1. Wonderland by Jason Eskenazi – good lesson in composition and editing. Book design is superb. 2. Dream/Life by Trent Parke – those black and white photos, man! Anna Bambou “Memento”, great photos of a mysterious woman, her disapearance, and what she left behind…..
Trent Parke’s Minute to Midnight. A photobook about dreams, life, death and many more. Love the way how Trent edit the book as well. Araki’s Diary Sentimental Journey. No words can describe. “Evidence of Occupancy” is such an intriguing small book. Its 24 enigmatic photos, all taken with an iPhone, appear to be evidence photos from a possible crime scene. But are they? Or is something else going on? I have this gorgeous book by Penelope Umbrico, Range, that is all famous mountain photographs that she re-photographed and applied digital filters that look analogue to over and over again abstracting them. The book is an accordion and folds out into one beautiful page of overlapping mountains in bright colours. I love the concept of taking these beautiful images and recreating them with current technology. Rochester 585/716. There are rubbish photos, average photos, good images and some great one in there from a wide range of Magnum photographers but the thing I love about it is that each copy has one of the 1000 photos (from an edition of 3) as an 8 x 10 print. You could have an incredibly beautiful and valuable print or a load of rubbish so it feels like a competition as much as a book purchase. Absolutely depends on my mood, but Andre D. Wagner’s Here For the Ride is a recent favorite. Beautiful BW photos of life on the NYC subway. Many of photobooks made me richer than before read them by the lot of valuable information about photography. I really like Robert Adams’ I hear the leaves and love the light’. Very sweet book about his dog, kinships and home.